Once I bought the embroidery machine I started learning new acronyms. ME is Machine Embroidery. FLS is Free Standing Lace. So now I do ME FSL. I also sell some of these in my Etsy shop. Here is a picture of a special order I just completed last night. My machine kept breaking thread frequently. I did all the re-threading and even tried embroidering something else with other thread to no avail. I was so dis-heartened. I thought the machine had developed a fatal flaw. Then, while at work and away from it, I had an epiphany. So when I got home last night, I changed the needle. (duh!) What a difference! Of course, I re-tried one of the threads that was breaking and discovered that it does break even with a new needle. LOL….so that thread will be used elsewhere. Some threads just don't do well with the high speed of an embroidery machine. 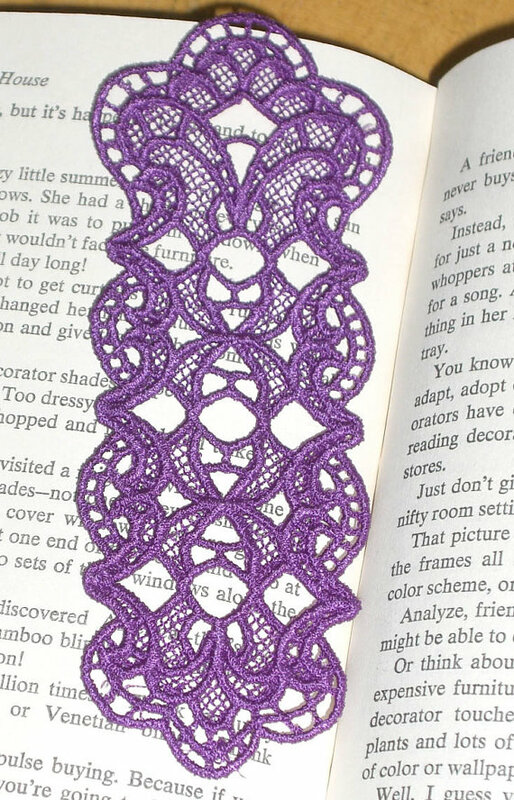 Here is another bookmark that I sold on Etsy. I have also done some FSL bookmarks on sparkly organza. It gives them a different look, but it doesn't photograph well. Beautiful ME FSL Gene. And, you are right about changing the needles and using good quality thread with high speed ME. Love them! 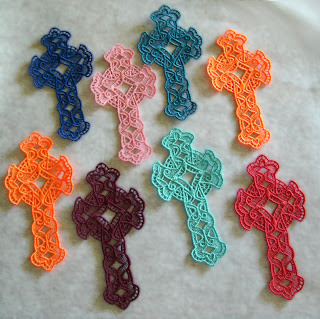 I want to do the "lace" Christmas ornaments. Don't think I have the right pattern, however. Beautiful work! I can personally say too that these are even more beautiful in person. Well who hasn't been there with the needle replacement thing. I have that problem all the time. My hubby will say your machine is making an odd noise and then I'll remember Oh The Needle! I knew these would be in demand! They are lovely. Think you have a winner here! You're doing great Gene on the FSL. Are you using the 75/100 needle for the FSL? Also, just a word of caution since I've been doing machine embroidery since 2003 now and am in way more yahoo groups than I need to be for that but, there are a lot of digitizers who do not allow selling of anything made from their designs. Be sure to read their TOS which should be in the zip file for the designs when you download them. Some digitizers are extremely strict even to say you can't even edit their designs at all, even to remove something like a leaf from a flower etc., and there are some that go way overboard and state you cannot change the color even which, is totally insane in my mind but, yea, I don't buy or download anything from them. While some will allow selling things made with their designs, they stipulate that ONLY those you purchase from them can be used that way and if you have obtained it as a free design then they state those cannot be used to make money. ME is a whole new world of rules, trust me. I got burned out from all the fighting between digitizers and the cut-throat way they were doing things against each other so I am VERY happy to have moved into the quilting world where it seems to be a much nicer place. Maybe I just haven't found anything like that in the quilting world but so far from what I've seen are extremely helpful people wanting to help others learn which is wonderful. I just thought I'd give you a heads up on the TOS stuff in case you hadn't been told anything like this yet.